So Sweetie and I are driving down the expressway, almost home with a car full of groceries. My eyes glimpse. the moving images of an electric billboard. It took a second, for my brain to catch up, then catch on. Could it possibly be a that big a type-o? I asked Sweetie to turn around so I could get a picture. One thing I've got to say about this man o' mine is when I ask him to turn around, he usually says okay. When we got back to the sign, I cracked up. Cause there it was in all it's misspelled glory. I suppose it could be said that the message speaks for itself, and spelling is sometimes overrated. Still, it makes me laugh. I have a couple of bad speller in the family and it always leaves me shaking my head. But to do it so publicly makes me giggle a bit...glad it wasn't me! 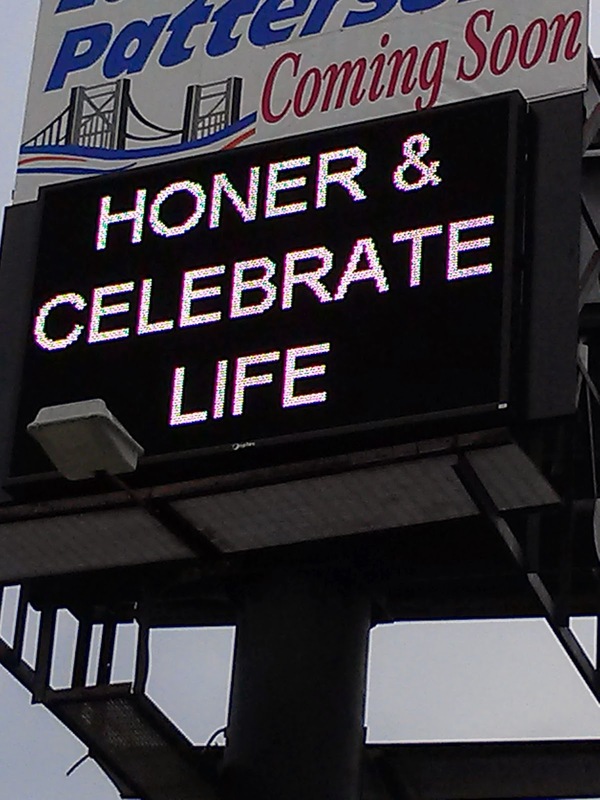 Honer yourself today. How brilliant of you to notice this ME! What's more brilliant is the honest, delightful giggle that erupts from me when reading it...all in innocence of course as I honer it!